My own children had a few more kid-friendly creations besides pancake letters...ants on a log, frozen bananas on a stick, cookies with faces, and other things. The internet, however, is bulging with ideas for kid food...many of which are a little over the top and include excessive steps to create food choices that supposedly will get children to eat. We, on the other hand, ate because we had played hard outside and were hungry! 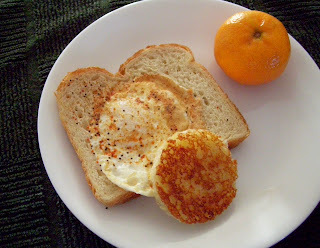 One little kid-friendly dish that I have to admit I still make for our big-kid breakfasts, on occasion, is Bull's Eye Eggs. Something about it is wonderfully tasty. Hint: Use a good quality bread for a better tasting meal. Spray hot griddle or frying pan with Pam. Butter one side of a slice of bread. Cut the center out of the bread with a biscuit cutter. Lay both pieces of bread, butter side down, on the hot griddle. 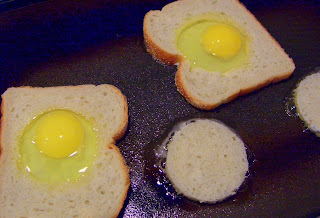 Immediately, break egg into the center of the cutout. Sprinkle with seasoning. When partially cooked, carefully flip the egg and bread slice over. Check the little cutout circle of bread for browning...set it aside when golden. Cook turned egg for 30-60 seconds or until the white is cooked.